Aliens. Xenos. Extraterrestrials. UFOs. Little green men from Mars. Things not of this Earth have long fascinated the human race, whether it be debating if they exist in reality (and searching for evidence that they do) and what they might look like, or simply enjoying having them in our fiction in all their manifold forms. When it comes to the latter, there has been much discussion of their portrayal and characterization over the years, and not just in this franchise, with many prominent alien characters having gone on to become classic fictional icons: just look at Chewbacca, or Spock, or E.T. And while the likes of Wicket and Jar Jar Binks may not necessarily be the most popular characters in the saga, they’re still guaranteed to be instantly recognizable by millions. But we’re not here today just to talk about specific alien individuals, that subject having been flogged to death and beyond already. What we’re going to discuss is the more general matter of aliens as species: their conception, design, and implementation. Somewhat more so than their human counterparts, alien characters tend to be strongly tied in physical form and personality to the specific purpose for which they were created, and whatever character traits that they display in that role are often treated being as representative of their entire species. Take Jabba, for one example. A slimy, corpulent, and disgustingly sluglike crime lord, who in the Expanded Universe is revealed to come from a whole planet of slimy, corpulent, and disgustingly sluglike crime lords. I look at this picture, and it tells me that somebody high up in the costuming department had a serious grudge against noses. While this often results in an entire alien race coming across as unfortunately one-note, it’s not an entirely unreasonable approach to take from a practical perspective. There are no alien audience members to appeal to and no existing alien cultures to represent the nuances of: so of course the bulk of the time and effort involved in the creation of a work of fiction will be dedicated to the human characters, whose perspectives the human audience will naturally be drawn to more strongly. If an alien’s design proves unexpectedly popular or iconic, other works may make greater use of them later on, but they’ll rarely be created with such a future in mind: whoever designed the Duros in A New Hope most certainly never saw Cad Bane coming. For this reason, most members of alien species will never graduate beyond the roles of supporting characters and antagonists, at best, and at worst they’ll merely exist to provide a splash of color and some spice when filling out the background of a scene. Even Chewbacca, famous as he may be, is the eternal sidekick, never to have his deeds in A New Hope properly recognized, content to serve as Han’s best friend. Here, again, the alien’s role shines through in the traits of his species, particularly his ability to comprehend human speech despite his inability to respond with anything more than animalistic grunts and howls, which lends him an endearingly canine air (and who doesn’t love dogs?) while at the same time making it clear that he’s there to support and protect the heroes, as a good dog should, and not usurp the stage from them. It’s important to exercise caution in this area, however, as in many ways the strange or comical alien character is a “safe” futuristic recycling of how foreigners used to be (and still are, in many cases) treated in fiction – there only to oppose or aide the hero, or amuse the audience with the strange mannerisms and customs, and never as equals. It’s already generally considered a difficult task to get audiences to empathize with protagonists who come from different backgrounds – and that’s just within their own species. For them to accept something truly alien as the protagonist or even simply as a character on equal footing with the heroes, you’re normally going to need an outline that resembles humanity as closely as possible. Usually, this means a character with only minor cosmetic differences, something along the line of pointy ears, chromatically irregular skin, or a ridged forehead (all of which were frequently demonstrated on episodes of Star Trek). 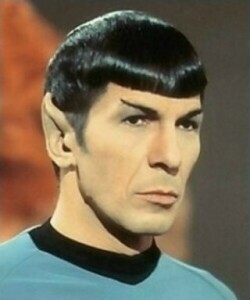 People are probably never going to stop making jokes about the pointy ears, but the important thing is that they’re never going to be able to separate Vulcans from Star Trek. It worked. For works on an extremely tight budget, it’s also possible to have the alien appear outwardly human while maintaining that there are distinct (but conveniently invisible) internal differences. While the obvious lack of effort involved in such designs has been much maligned over the years, it does come with benefit of being unlikely to alienate the audience, as it makes it easy for the actors to properly convey recognizably human emotions and expressions that will resonate with viewers. One notable instance in which aliens are likely to receive something more than a superficial treatment is when human protagonists visit their homeworlds, in which case a culture and government are usually invented to accompany the change in scenery. It’s popular to draw from contemporary societies and political structures in such scenarios, but I really must advise against harvesting too much from or too closely to reality. If your treatment of them is less than favorable, then you run the risk of offending your audiences if their see echoes of popular depictions of their nation in the primitive, desert-dwelling, resource-rich, religiously splintered Swokes Swokes, or the very clearly Ottoman-inspired (in their pre-catpeople comic appearances) Zygerrian slavers. Furthermore, even if you don’t actively offend anyone, there’s still the distinct possibility that your audience will be abruptly ripped out of the fictional universe you’ve gone to great lengths to craft and rudely thrust back into their own world. There are more than enough alternative concepts of governance and theoretical societies to draw from without having to import directly from reality. Thus far, I’d have to say that from what we’ve seen, the Sequel Trilogy is off to a strong start when it comes to their alien designs. Despite the many advantages offered by modern computer-generated imagery, I don’t think we’ve reached the point yet when the aliens it produces consistently look better and more natural than costumed actors (see: Green Lantern), and I’m heartened to see The Force Awakens harkening back to the low-budget, bargain bin reject costume aesthetic of the Original Trilogy. It wouldn’t have hurt to have Wookiees of a few different shades in there. 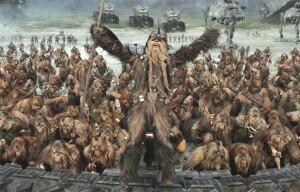 Or do the brown-haired Wookiees discriminate against the black-haired Wookiees and the red-haired Wookiees? Do Wookiees have hair dye? Still, there’s always room for improvement, and there are a number of ways in which I think the franchise could make better use of our alien species going forward. 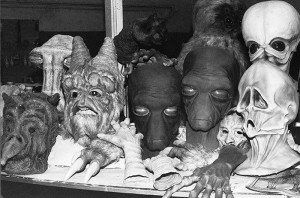 One thing uncommonly seen among different members of the same species in fiction is the kind of variety found in humanity: we’ve seen some examples in the past, such as Wookiees with different colored coats, but more of that across a broader range of beings would be welcome, and could add much diversity to background characters while at the same time making members of any particular species seem much less interchangeable. A broader array of non-humanoid physical templates for alien species would also be desirable, especially in comics and literature where the designs are not bound by the limitations of the costume department’s capabilities. There’s just as much room out there for piscine, avian, insectoid, crustacean, marsupial, simian, reptomammalian, and Lovecraftian (with too many tentacles and eyes in all the wrong places) alien species, and these would also provide excellent opportunities to explore alien cultures based in naturally-occurring non-human social groups. 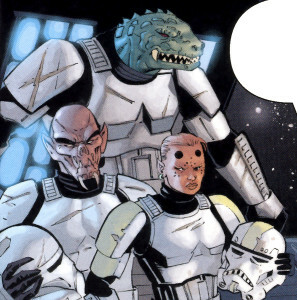 All you need is one scene of stormtroopers donning their helmets before going into battle, and you can simultaneously establish diversity while making clear that it’s a new Empire, and that these are not clones. 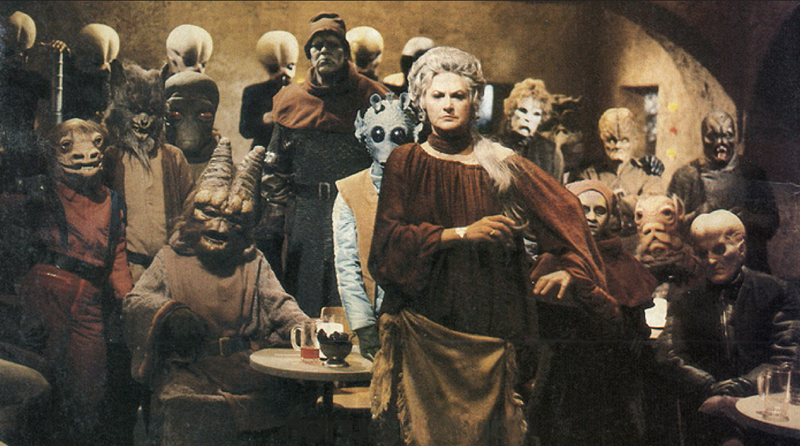 The rebellion has long been sold as a multi-species affair, but allied aliens were sorely lacking in both A New Hope and The Empire Strikes Back, and were not even all that numerous in Return of the Jedi. I should hope that, going into the Sequel Trilogy, the underworld does not continue to have a monopoly on all the interesting alien background characters. Even the Empire could use a few: Legacy did give us alien stormtroopers, after all. Aliens are almost certainly never going to replace humans as mainstream choices for protagonists, but that’s exactly as it should be. As colorful as diversity in alien species may make the universe, it should never be treated as a replacement or substitute for diversity in human characters. Aliens exist primarily to fulfill roles that are not entirely unlike furniture or wallpaper, and are there first and foremost to enhance the stories and experiences of humanity. Our first priority and guiding principle should always be to ask ourselves how we can make new alien species as interesting as possible for the heroes to engage with and for the audience to see. We’ve come up with a lot of alien species over the years: some have been hits, others misses. Trandoshans and Wookiees and Duros and Sullustans and Mon Calamari managed to capture the imagination of authors and audiences alike and can now be found in just about any work or role, while one is rather less likely to encounter Shistavenen wolfmen or Pa’lowicks or Thisspiasians or Xexto outside of their most famous members, and I, for one, look forward to welcoming new additions to the galactic community as prominent as their predecessors. After all, there’s no longer any material to oppose the idea that new species might be as numerous or influential in the Senate as those we already know so well. The slate is still clean. I’m going to start by saying that I completely agree with you about being glad to see the return of the bargain bin background aliens. There’s just something fun about them. That said, I do think that CGI combined with motion capture is at a place where you can make some completely out there alien characters looks incredibly realistic especially when you’ve got some as talented as Andy Serkis doing the mo-cap. His and Lupita’s characters definitely have the potential to break out of the ‘still humanoid in shape’ mold that we’ve seen so much with aliens in Star Wars. Obviously, it’s easier for comics and books to do this but I definitely think that films can pull it off too.